ItemCUMB_983.025.002 - 2 Envelopes and 1 Letter from Hong Kong to Cumberland B.C. Item CUMB_983.025.002 - 2 Envelopes and 1 Letter from Hong Kong to Cumberland B.C. A: 24 x 19 cm; 1 letter; paper; white, black and red writing. 2 envelopes (B-C); B: 14 x 7 cm; red, white, black writing, red stamp; C: 10.5 x 16.5 cm; white, black writing, red stamps. 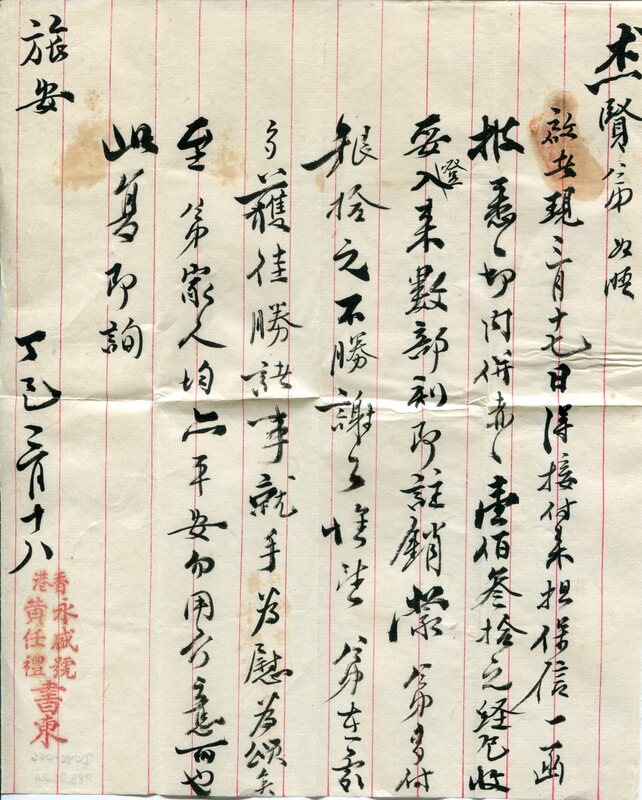 Envelope (B) is from Hong Kong and addressed to Hwang Je-Syen from Hwang Ren-II; letter (A) stating that the sender received money from Je-Syen and that “Your family is fine, so don’t worry about it.”; envelope C is addressed to “Sing Shun & Co. PO Box 183, Cumberland B.C. from “Wing Shing in Hong Kong; Cumberland B.C. postage stamp on the back. Date: May 1930; Photographed: 983.025.002 A (letter); Full translation available.